Leaders of Igbo-Elejo Island, also known as Snake Island community in Amuwo Odofin Local Government Area, welcomed officials of Spaces for Change [S4C], Communities Alliance Against Displacement [CAD] and the French Embassy to their community on Friday, March 23, 2017. Welcoming the visiting delegation to the community, the Baale, Chief Ade Adebuluye, his Olori, native chiefs and local residents came out in their numbers to share experiences of life on the water, including the daunting challenges the community encounters with the rise in metropolitan society, urban growth and changing climatic conditions. The challenges range from issues of housing, youth unemployment, lack of access to education and healthcare, absence of opportunities for inclusion in city regeneration and climate adaption strategies. A guided tour of the Island revealed deeper insights for developing resilient and culturally-appropriate urban regeneration initiatives for the inhabitants of coastal settlements in Lagos State. CAD, a movement of displaced communities and communities facing urban challenges, including threats of forced evictions, facilitated the visit to the Island as part a broader move to build solidarity among communities witnessing increasingly complex urban issues and collaboratively strategize on how to defend targeted communities. In her opening remarks, Comrade Mrs. Williams, CAD’s women leader (Otto Ilogbo) talked about the transformative changes that have been recorded as a result of CAD’s community organizing and mobilizing techniques in the movement’s member communities. Other CAD representatives – Hon Tope Olaku, representing Oko-Baba, Comrade Ebiesuwa Seinde and Bilikisu, representing Badia East and West respectively – also took turns to talk about their ‘voluntary’ work for the common good of their respective communities, with all of them emphasizing the contract of active citizenship which undergirds CAD’s operations. Victoria Ohaeri, S4C’s executive director commended CAD, especially the community leaders actively engaged and committed to the advancement of social, economic and political progress in their communities despite huge resource constraints. Although S4C provides technical, financial and legal advisory support to CAD, it is the participation of empowered communities capable of defining the problems they face and determined to tackle those problems together, that makes the organization’s advocacy more sustainable. The French Embassy in Nigeria is interested in issues affecting vulnerable populations. ‘Along this line, they provide support to communities that are facing the kind of challenges you are facing. This is an opportunity to understand the issues in your community’, the French Embassy representative, Deborah Buisson explained. So, she has joined the visiting delegation to see the community, to observe, to understand the urban challenges that they face, and the kind of interventions needed to address their concerns and priorities. An interactive session with the community members afforded an opportunity to learn about the history of the community. The community derived its name from large snakes that once plagued the area, long before Nigeria gained independence from the British in 1960. Though comprised of different ethnic groups, with fishing as a major occupation, many residents lack access to formal employment. Some have received some form of vocational training in carpentry, electrical works, auto-repairs, hair-dressing etc, but still lack the certification needed to access jobs in the labour market. The location of the community on an Island has further disconnected them from the city, limiting their access to social and economic infrastructure needed to improve communal livability. For instance, there is no access to electricity. Ferrying electric poles across the sea will cost at least, N25million per pole, according to a government estimate. The lack of maternity and healthcare for women in the community is an issue of great concern. Pregnant women go through a lot of difficulties during childbirth because of the absence of health centres. During labour, some have to be ferried across the high seas to the nearest hospital. The only primary school in the community, Cherubim and Seraphim Nursery and Primary School, was established in 1954. School children are therefore, forced to go to another community to continue their secondary education. Not only that, women in the community are predominantly fisherwomen. They need to be empowered, and exposed to modern ways of doing business. Beyond the problem of infrastructure, the community witnesses sea-level rise every October making social and living conditions more difficult. High sea level rise has many implications for community wellbeing and functionality. For instance, local residents are forced to walk on water during this period. Kids cannot go to school because classrooms are filled with water, while homes get flooded. They adapt to the changing climatic conditions using different local approaches such as logging their homes and communities during the period to create floating pathways for people to walk on. To avert the seasonal disruption to children’s education, the Cherubim and Seraphim erected on an elevated platform lets out a part of the church building to school children every October. Some houses are also built on stilts to lift the structures from the ground. There are also private wells in the community where clean water for cooking and drinking is stored ahead of the sea level rise. 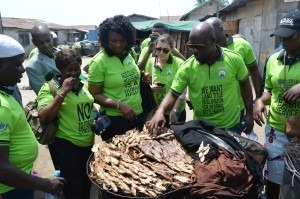 There is no known environmental management initiative designed to address these challenges in the community. This visit is one of the many ways S4C & CAD engages and learns from local communities. Two important lessons emerge from this visit. First, urban deprivations induced by governmental neglect become more devastating when combined with changing climatic conditions. The second lesson that emerged from the interactive sessions is the need to understand the indigenous-driven climate adaptation initiatives, and integrating them into existing urban regeneration schemes and arrangements. Building the adaptive capacity.of the residents is imperative, but this cannot be divorced from their major pre-occupation as fishermen, their cultural values, and traditional ways of life on the coast. 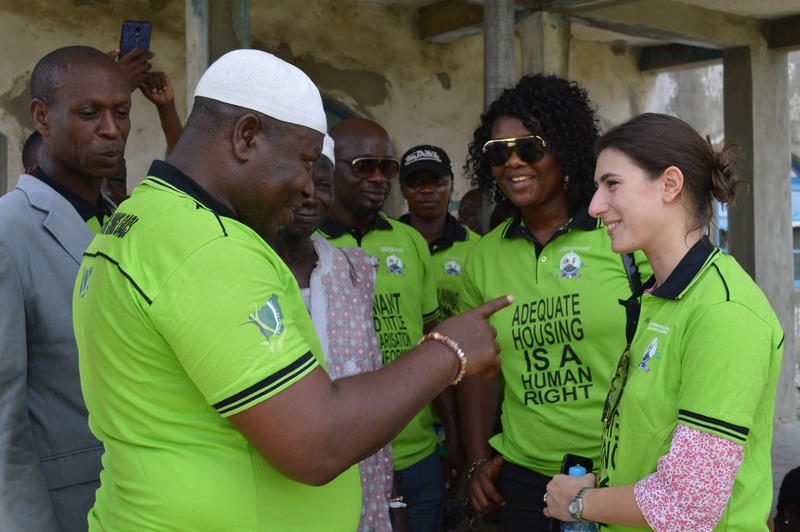 These important lessons learned during the tour will not just inform S4C and CAD’s public advocacy, but also feed into campaign strategies to draw government’s attention to the pressing needs of the Igbo-Elejo community and beyond.